I don't like the word "ho," but there's no other way to describe what I do with libraries. I shamelessly use the part of it that I need, then tramp on over to the next town and take something else from their library. I go to Greenwich, Stamford, and Darien- this shocks many people. How can I do this? 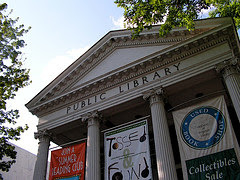 Well, I don't know why I am the only one who knows this, probably because I read (or used to until I got this laptop) obsessively: any CT resident with a library card can go to the library in any damn town they want. Did you hear that? You can go to the Darien Library, park easily, and get a book or CD. Small library, great magazine room. Ever since I've moved to the Northeast, I've worked in Greenwich, so it's been very convenient to use their sickeningly amazing library. I say sickeningly only because now that I have a new alliance to Stamford, the superiority of Greenwich's library angers me. I've also lived in Darien and Norwalk and have seen how their libraries operate. It's not that the Ferguson Library is inferior; it's fine. However, the ease of parking at all other area libraries (even Norwalk!!!) make the Ferguson seem... inaccessible. Absurdly so. I'll complain about parking in another entry. First, let's say what makes the Ferg amazing. It's not the Starbucks, and it's not the Passport Office, although that can come in handy. No, the Ferg's claim to fame is its used book store attached to the library. I don't know of any used book stores in the area. I'm sure they exist, and it's on my list of things to look into. For now, give all your old books to the Ferg, and scour the ample shelves for new ones for you. I've found some good books there. That little store, run by Friends of the Ferguson, makes around 100,000 a year for the library. So, readers sustain the library. That's pretty cool, but it makes me even more irritated that the city recently proposed cutting library hours (as if the library isn't hard enough to get to) since the library was 100,000 dollars short- on their 8.4 million dollar budget. Huh? Visualize that tiny sliver of the pie chart. Stamford and Mayor Malloy, can't ya throw the library a bone, or tiny pie piece? One with 100,000 dollars in it? Despite the fact that the Ferg obviously needs you, I still encourage you to try other libraries. The Ferg can't do it all, and the exploration will make you appreciate what the Ferg does offer. (A good selection of books, good ESL and Literacy Programs, cultural events like Italian Heritage Month and the Haitian Book Festival, nice librarians- and I hope you'll discover something else). Thank you to Lanamaniac for her photo of Stamford Library, part of her great flickr set on Stamford. Ferguson- decent selection of books. Weed Branch- small but packed full of books; it's right near the Hope St. NYSC. I love it. You'll find the smaller branches useful. For example, when you visit the Ferg's online card catalog, sometimes the Weed Branch might have the book. And, parking is easier at the three smaller locations. Although I can't vouch for South End parking, I can't imagine how it would be harder than the Ferg. The main branch, on Route 1 off exit 3, is stunning. It's hard to go anywhere else after going there. The "new arrivals" section feels almost as big as the whole non-fiction section of Stamford's Weed Branch. There's a nice CD collection upstairs, an art gallery... oh, you get the picture. Great magazine selection with the old issues archived on shelves right there... it's just gross. It's wrong to be so good. However, I go to the Ferg because it's in my town, and I'm trying to make it work. Greenwich's smaller branches are Cos Cob, Perrot, and maybe one other; they are small but very nice, and may have a book that the main branch doesn't. Embarassingly, Norwalk has better parking and as good of a book selection as the Ferg. It's off Rt. 7, first exit. Like the Ferguson, half of the non-fiction books are on one floor, the other half, downstairs. (Greenwich has all non-fic except music on floor one, and all fiction upstairs, which makes more sense to me.) Norwalk's downfall: a very small "new arrivals" section. It is absolutely pathetic. Lovely sunlit magazine reading room and a good CD collection. The book selection is small, but it's near Post Corner Pizza, a personal fave with its chicken souvlaki and crazy-good pizza. You can look at the card catalog online, and access your account with the card's bar code. And, if you get a book from one library in the town, you can return it to any other. So, if you manage to get to the Ferg to check out a book, you can return it elsewhere: say, the Bennett branch on Vine, on your way to Border's or Kit's Thai Kitchen, or the Weed Branch on your way to the Hope St. NYSC or the mega-efficient Camp Ave. Post Office. You are the only library in the area who does not have free, convenient parking. Dammit. I just don't know how to fix this. I understand that your library is one of the few right in the downtown area, and you are the biggest city in lower Fairfield County (I don't count Bridgeport, because their local papers don't really pay attention to Stamford, so there). Here is my one suggestion. The parking spaces on Bedford right past the library only let you pay for one hour. Any serious book browser will laugh in your face. An hour to pick books and check out? Let's at least get those set to two hours, and get them to take credit cards, or for god's sake, dollar bills. Does anyone in this world carry 8 quarters? And I mean, anyone in their right mind?